There’s a reason Stanley Cup championships produce some of the best celebrations in sports. After four rounds of some the most demanding competition on earth, the euphoria can no longer be contained after all the sacrifices needed to claim the hardest trophy to win in sports. Defenseman Sean O’ Donnell helped Anaheim win its first Stanley Cup last June. In 2001, as a member of the New Jersey Devils, O’Donnell came as close as a player can get without tasting champagne out of the Cup as New Jersey was eliminated from the Stanley Cup Final in a grueling, seven-game series with the Colorado Avalanche. Every spring, players scratch and claw to finish an exhausting 82-game regular season just for the right to get further battered and bruised in the playoffs. Once there, they cast a blind eye to pain and injuries for the chance to win a championship. And the numbers keep adding up. By the time the Stanley Cup Final begins, each team has played roughly 100 games, and the physical toll on some is daunting. But for a shot at the Cup, players will make whatever mental and physical sacrifices are required. Some teams, like the New Jersey Devils, go so far as to stay in a hotel throughout the playoffs, even during home games, believing the removal of every-day distractions helps sharpen the necessary focus. Anaheim defenseman Chris Pronger has reached the Stanley Cup Final in each of the past two seasons, with Edmonton in 2006 and Anaheim last season. He knows better than most what a grind the process can be. 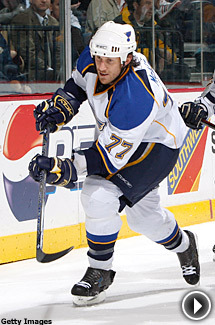 Jay McKee reached the Stanley Cup Final with Buffalo in 1999, losing in six games to Dallas. He also reached Game 7 of the Eastern Conference Final in 2006 before the Sabres lost to Carolina, the eventual Stanley Cup champion. So McKee knows just how hard it is to win the Stanley Cup, and he has suffered his fair share of heartache in pursuit of that goal. Still, he shows up each season ready to renew the quest. Rarely in other sports is there the enthralling duality of fierceness and familiarity that regularly occurs in hockey. In the course of a long playoff series, off-ice friends will go nose-to-nose to win a game. Boundaries will be stretched and liberties will be taken to reach hockey’s pinnacle. It all makes for compelling theater, even for those players themselves. Gomez experienced the test of a long playoff run in his rookie season, helping the Devils to the 2000 title. San Jose rookie Torrey Mitchell hopes to follow in his footsteps this season. Even though Mitchell hasn’t been to the playoffs yet, he understands what lies ahead. For further confirmation, he can ask Pittsburgh goalie Marc-Andre Fleury. He was part of a young Pens team that stormed its way into the postseason last season, only to see their dream die in a five-game first-round elimination at the hands of the more experienced Ottawa Senators. This season, the Penguins are a year older, a year wiser and a year stronger, but there is little doubt the lessons learned in 2007 won’t be far. Everyone is excited to be in the Stanley Cup Playoffs each April, but only the most stubborn and most battered players are left to enjoy the party in early June.